We love the seating facing the full pane of windows which offered a panoramic view of the hustle and bustle of the junction below, and would gladly wait for a table for the experience. Thankfully, a couple was just exiting as we arrived and we didn’t have to wait for long. A quick look at the menu as well as the chiller display and everything looked so pretty and tempting! But it doesn’t take us much effort for us to decide on what to try. St Honore Rose et Framboise exuding an aura of aristocratic elegance and decadence somewhat, that reminded me of the legacy of the brioche queen, Marie Antoinette. The luxurious Crème Chantilly studded with fresh raspberries like crowning jewels on her Renaissance wig. Color scheme of red and pink hints of fiery temperament amidst bashful feminism. So much for letting my imagination run wild! The piece was nothing short of being delicious. The sweetness of the rose water scented Crème Chantilly went well to sooth the slight acridity of the raspberries. In fact, more raspberries were embedded into the cream, balancing the latter nullifying any suggestions of being cloying. The puff pastry base remained reasonably crisp, while the miniature balls of choux pastry was filled with rose-flavoured crème pâtissière which had a smooth mousseline like texture without the heft. What was most pleasantly surprising was the generous disc of gelee au framboise compote which made the whole piece delightfully light and refreshing, despite the amount of cream incorporated. 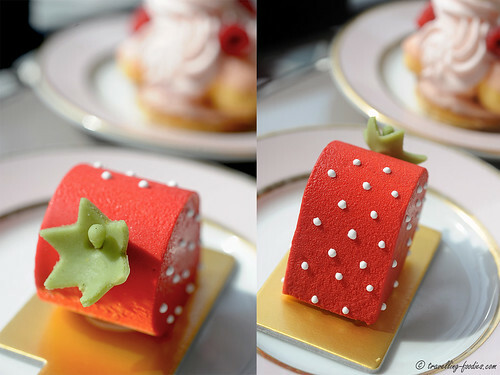 Despite both of them being “fruits aux rouge” themed creations, Fraise transpires a totally different mood and aura altogether. 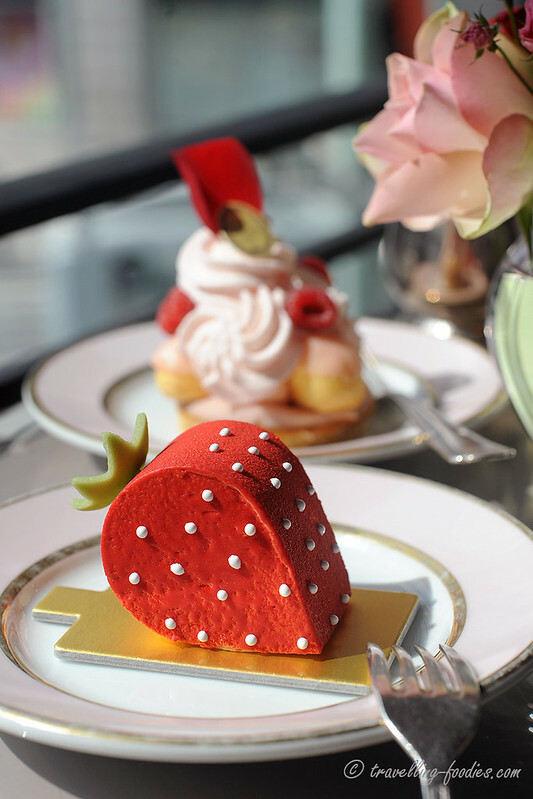 Boldly constructed to bear resemblance of the fruit in a somewhat “cutesy” manner, Fraise seems to be Ladurée’s attempt to shed their stereotypical image of being a staunch and stoic custodian of old-school classic French pastry-making, what some would regard as a somewhat strict and rigid discipline. 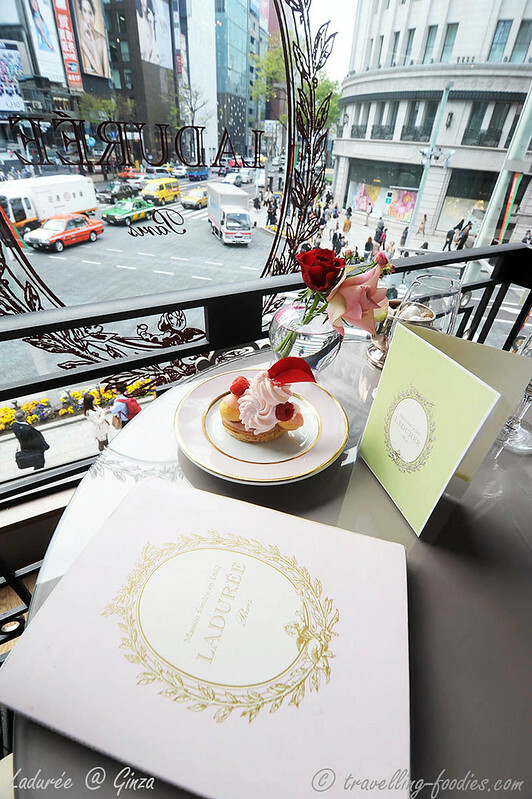 Through this piece, it is perhaps Ladurée’s intentions to show that they too, like the more “hipster” kids on the block like Victor & Hugo and Pain au Sucre, are capable of exercising creativity and playfulness in their creations. 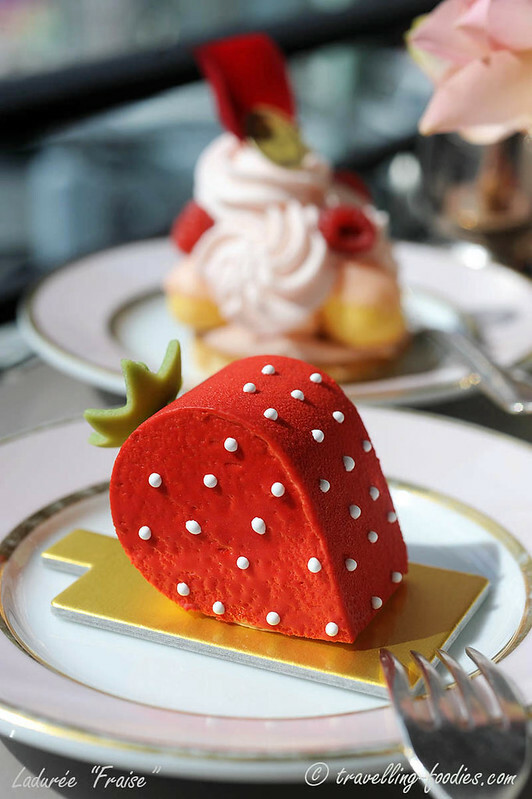 Beneath its chocolatey crimson facade lies a creamy and smooth strawberry mousseline and a confit of sangana strawberries sandwiched between layers of coconut dacquoise. What was most delightful is the fraise confit which beared whole fruits that preserved much of the original melange of sweet and tangy flavours carefully balanced with as little sugar used permissible. For me, the ultimate surprise was the coconut dacquoise. 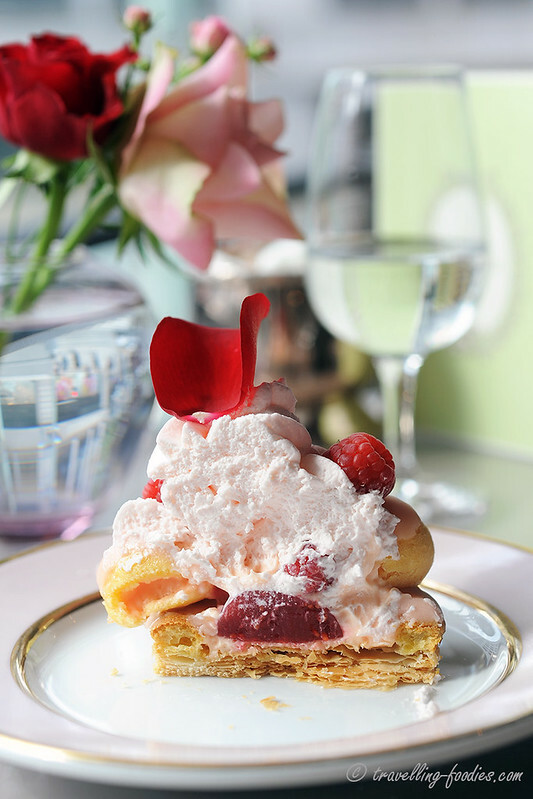 It not acted perfectly to keep the strawberry mousseline from being stained by the confit, keeping its shade of pristine pastel pink, but also lent much texture to the piece in its entirety. I wish I could show you a photo of the cross-section of the piece but fortunately or unfortunately, it was finished in quick successions amidst the incontrollable murmuring of “ooohs” and “aaahs”. Very fine pastry-making indeed! Ladurée @ Ginza Mitsukoshi did not disappoint indeed! This breathes an air of optimism and anticipation to what we could expect in Singapore next week. Hopefully it would be of the same standard, if not better! This entry was posted on April 9, 2013 by Alan (travellingfoodies). 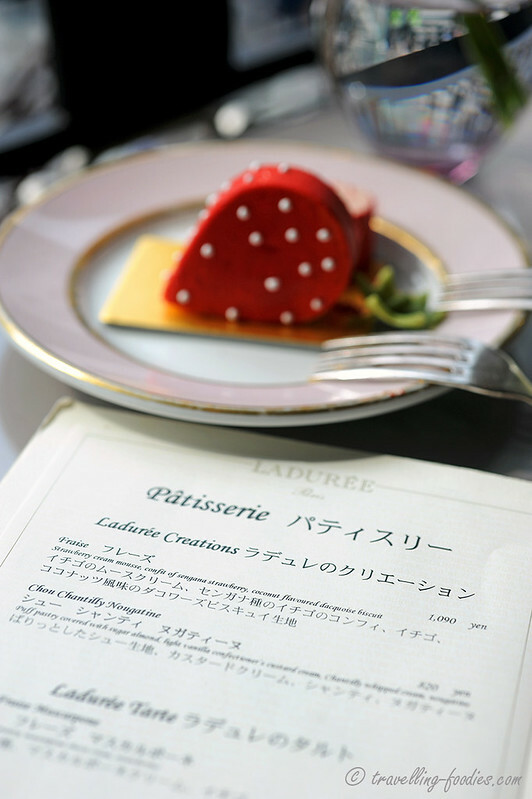 It was filed under Food, Travel and was tagged with creme chantilly, fraise, french pastry, ginza, Ladurée, patissier, pâtisserie, st honore, Tokyo. Hi Caroline! Thanks for the encouragement! I’m heading to Tokyo on Saturday and after reading this I am definitely putting it on my list! The patisseries look awesome! Count yourself lucky because they are offering only macaroons in the Singapore outlet, which are sadly not my favorite and the prices hurt. 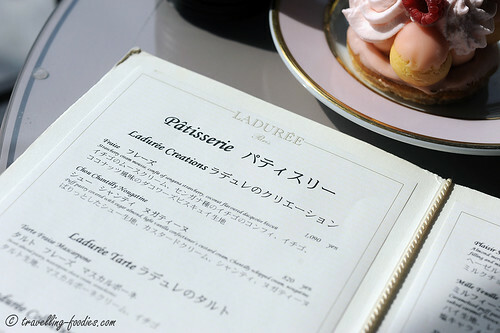 I visited Ladurée in Paris, and I can safely say that Tokyo’s Ladurée is pretty close, perhaps even better! Bon chance! 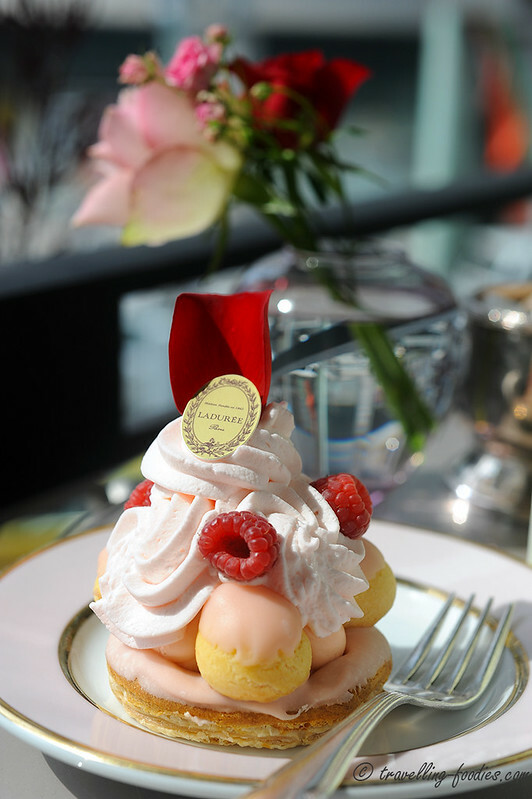 yeah… really disappointed to know that Laduree in Singapore (and Hour Glass who brought them in) decided to “play it safe” with only macarons and bon bons… sad…. Just a suspicion, they might not even have a kitchen here in Singapore, since they’re only offering macarons. That means… I could be wrong.